With complaints about McDonald's sponsorship of the World Cup still sounding, Adweek is reporting that the United States Youth Soccer Association has signed a multiyear deal making Burger King its official quick-serve restaurant partner. 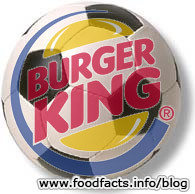 BK has said it would leverage the deal through "integrated marketing communications campaign that includes national restaurant promotions and a series of Burger King and youth soccer programs." The US Youth Soccer Assoc. has 3 million registered players between the ages of 5-19.